Even though rabbits are herbivores, they still need a small amount of protein in their diet to keep them healthy. Feed your bunny a complete diet containing plant-based proteins, fiber, carbohydrates, vitamins and minerals so that she gets all of the nutrition she needs. While vegetables may provide some of the protein your little one needs, pelleted diets provide the proper balance of this and other ingredients for your bunny. Bunnies need protein just like humans do to supply them with a source of energy and support healthy growth, especially when younger. Proteins contain amino acids, which your rabbit's body needs to function properly, build muscle and put on weight. There are 10 amino acids that are essential for your rabbit's diet, which include arginine, histadine, lysine and leucine, according to the "Journal of Nutrition." The average pet rabbit needs between 12 and 16 percent protein in her diet, recommends Vetstreet. Pregnant and nursing bunnies need slightly more protein, around 18 percent. Larger amounts of protein for rabbits are unhealthy if fed to them long-term, leading to excessive weight gain, stomach upset and diarrhea. At least 18 to 20 percent of your bunny's diet should come from fiber, which keeps her digestive system working smoothly. A high fiber, low protein diet also helps to prevent hairballs and keep your bunny fit and trim. 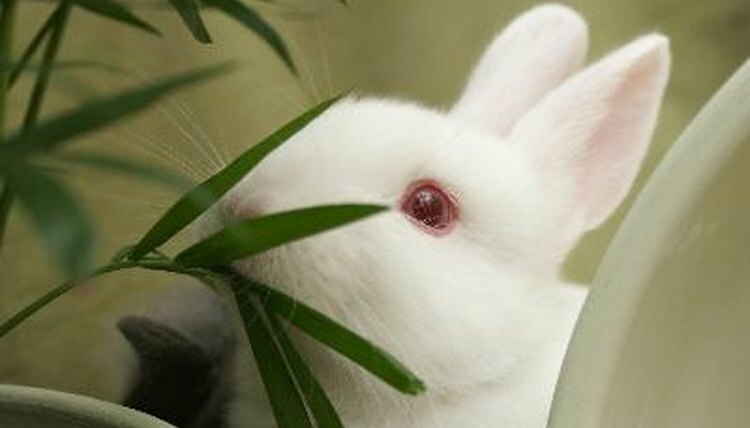 Rabbits are herbivores and thus their proteins and fats should come from plant-based sources, which they can more easily digest than animal-based ones. Look for pelleted diets, which contain ingredients like alfalfa, which contains high amounts of plant-based dietary protein for bunnies. Vegetable oils contained in the pellets provide the small amounts fats, around 2 percent, which your bunny needs to keep her coat shiny. Higher quality ingredients like grasses, including alfalfa or timothy should be listed as the primary ones in your bunny's feed, which are listed by weight on all types of pet food, according to the U.S. Food and Drug Administration. Grasses have a higher fiber content and lower protein content than cereals such as wheat, oats or corn. Not only do grasses provide a proper balance of protein and fiber for your little one, they are easier for bunnies to digest. Not all sources of protein are as digestible to rabbits as alfalfa, including soybean meal, gelatin, casein or gluten. Rabbits can digest about 75 percent of the protein contained in alfalfa and that this digestibility is partially based on the balance of amino acids the protein source contained. Keep in mind that if your bunny lives outdoors, she'll need more protein in her diet than an indoor rabbit because she'll burn more calories, around 16 percent; indoor bunnies only need around 12 percent. Consult with your rabbit vet to determine how much protein your bunny requires, depending on her age, environment and activity level. Don't overwhelm your bunny with protein because high-protein diets can result in a slow-down of the rabbit's digestive system and an impaction of the matter in the system. This condition, known as GI stasis, causes a lack of appetite for your little one and is potentially fatal for your furry friend. Help prevent this by providing your bunny with fresh vegetables, greens, hay and the occasional fruit she needs to get the fiber she needs, in addition to the pelleted food that provides her with protein and other nutrients. University of Minnesota Extension Program: Feed is Feed...Or is it? The Nature Trail: Treating GI Stasis In Rabbits -- Bunny Stops Eating? Act Now!